Family Island Time | Turning my world upside down! 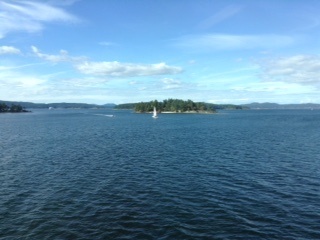 A few weeks ago, we moved my mother in law to Courtenay on Vancouver Island. She is now living happily with her eldest daughter and husband in a great home overlooking a bay filled with little sailboats and the odd yacht. It seemed a good time to go visit along with Leon’s eldest son and his family. 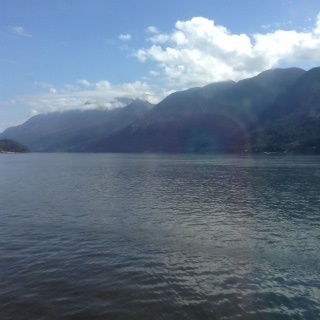 We boarded the ferry at Horseshoe Bay this time as we hadn’t had the foresight to book our crossing earlier than the night before. Although we didn’t manage to sail on the same ship as our relatives, we met up at Rathtrevor Park where Roadie had to make a toilet stop. (You know, we had to empty the grey water tank.) As we drove closer to the beach, I was reminded of how much I had enjoyed our stay there 2 yrs earlier. I was excited to return and show Leon’s grandson that incredibly large beach. But for now, we thought it prudent not to let him see the beach or we might never get him to leave for the day. We drove to the house in Courtenay and spent a lovely evening with my mother in law or Olie, as she is called by the greatgrandchildren (it’s a short form for Olemor – Old Mother). Olie took us out for dinner at the local White Spot where we all enjoyed a good meal and a nice glass of wine. Leon’s sister, Hanne, was away for the night having gone to a wedding out of town, so he was charged with feeding the horses a few times a day. The grandsons had great fun helping out! 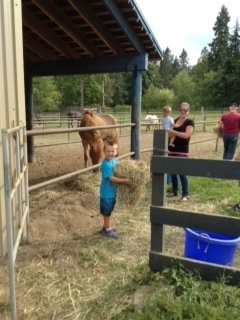 Unfortunately, Leon’s son Ryan is very allergic to the hay or the horses, or both, so he was happy to have packed some antihistamine. On day 2, we went to a local beach closer to Royston. It was full of tidal pools and all kinds of great little water critters for children to capture. The skies started to cloud over and darken at one point, so we thought it best to move on and explore the small town of Cumberland. 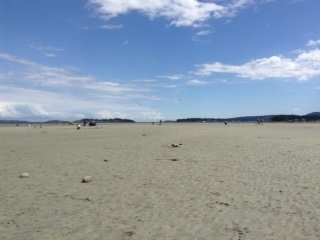 We stopped for a nice lunch at Mar’s on Main and then moved on to the beach and park at Comox Lake. After an hour or so, we returned to Cumberland for an ice cream and some active time at the local park and water play area. Did I tell you this 4 yr old grandson is very, very active? I takes 4 adults to keep up with him. His little brother is not a year old yet, so he is easier to watch. By the time we got back to Hanne and Ted’s, we were all tired but quite ready for a good dinner. It was my turn to cook and I made grilled steak salad for all. Off to an early sleep and ready for a big day at the beach in Rathtrevor the next day. Day 3 saw us in Parksville, first at the amazing beach, then at the International Sandcastle Competition and finally at the huge community park in Parksville where the competition was held. They had an amazing array of structures to play on, both land and water based activities. Once again, our Eveready Bunny grandson kept going and going from one activity to the other, barely slowing down, in spite of the hot day. Dinner was back at the house in Courtenay where Hanne and Ted’s granddaughter and her mother joined us. We had a lovely evening, sitting outside on the back deck, overlooking the watery view. On to day 4 – a trip back south towards Victoria to visit with Leon’s other sister, Connie and family, with a stop at Cathedral Grove to see the old growth forest. The park was very crowded, so parking was an issue. But we managed to fit on the side of the highway and walk around for a bit. The next stop was a place called Goats on the Roof. 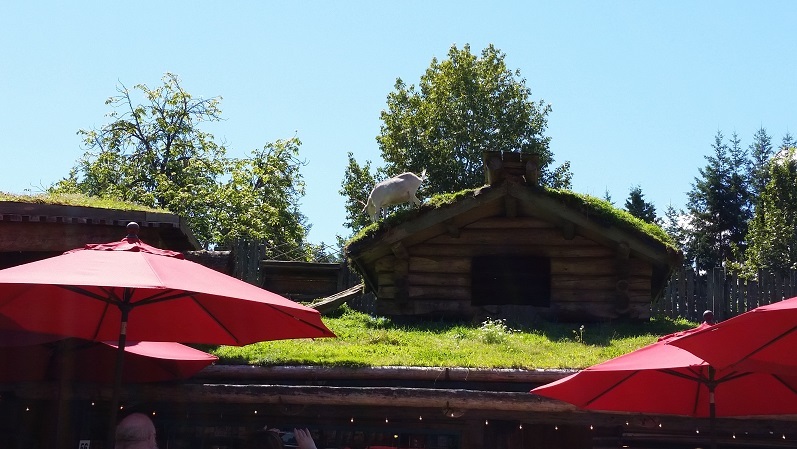 It’s a large general store with a grass roof and real goats munching away on it. There is a whole tourist village built around it where you can get a snack or a whole meal. We made some sandwiches and sat at a picnic table to have our midday meal before moving on to the big city. We got to Connie’s just in time for a nice long swim in their new pool. Everyone was floating around on some pool chairs with the occasional water fight happening between the adults and the one grandson. We enjoyed ourselves so much that we decided to spend more time there the next day. Unfortunately, I woke up with some sort of stomach flu and really didn’t enjoy any of the day at all. We got on the 5pm ferry and I slept a bit and managed to get rid of my fever. The next day, I found out the grandson had something similar. We had shared a juice the day before, so I wonder if we shared a flu or if the juice was off. No matter, it seemed to have cleared up the last of my other flu that had been dragging along after almost 3 weeks. I assure you, I now have my appetite back, fully! I bet your grandson enjoyed seeing those goats on the roof. I guess so. Unfortunately, he wasn’t feeling well that day. As I mentioned in the post, we both ended up with the flu the next day. I thought they were neat though. I had heard about them from another tourist a few years ago. Didn’t realize it was such a big complex with all kinds of shops.